This is a specialist wheel designed to spin extra bulky yarn used in rug weaving and chunky knitting or for plying bulk quantities. The orifice is extra large. 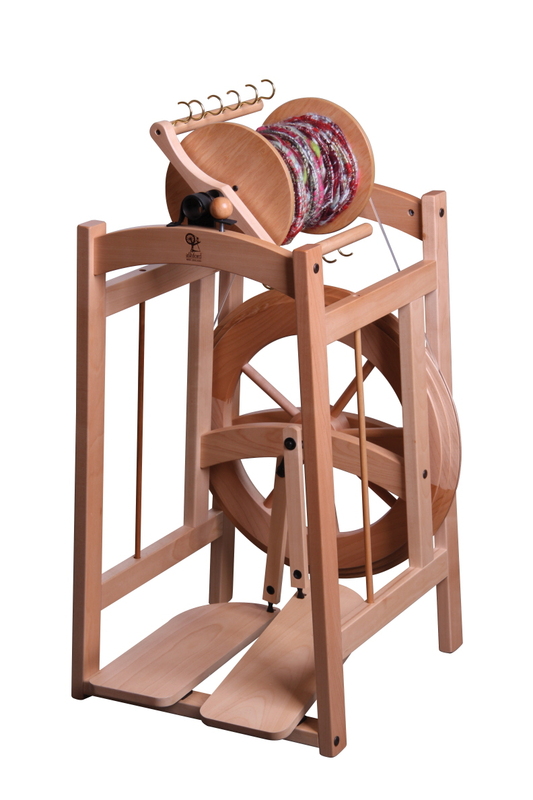 The ball bearings and double treadle allows for an easy start and treadling. The slow drive ratios and sensitive leather flyer brake system are ideal for creating unique novelty yarns. New 3 speed bobbin with easy 3, 4 & 5:1 ratios and capacity of up to 1kg 2.2lb. New polyurethane con-rod joints for smooth heal & toe treadling. Wider spaced treadle boards. Arched rails and factory assembled sides are easily assembled with bolts and barrel nuts. New maintenance free Polyurethane hinges for smooth & effortless treadling. Soft leather brake band and sensitive tension adjustment. Huge 27mm – 1 1/16” flyer orifice for really thick yarns. Provision for plying from 2 bobbins. New nylon universal bearings for the con rod.